David J. Hart received his B.S. from the University of Michigan (1972) and Ph.D. from the University of California at Berkeley, working with William G.Dauben (1976). 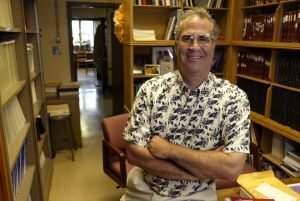 After two years as an NIH postdoctoral fellow at the California Institute of Technology with David A. Evans, he moved to the Department of Chemistry at The Ohio State University, being promoted to Associate Professor in 1983 and Professor in 1988. He has been named an Eli Lilly Fellow, Alfred P. Sloan Fellow , OSU Distinguished Scholar, and received the Stuart Pharmaceuticals Award for Excellence in Chemical Research(1986), the Columbus ACS Section Award (2000), and the OSU Alumi Association Distinguished Teaching Award (2001). Hart has also served on the Editorial Boards of the Journal of Organic Chemistry and Organic Syntheses, and served for three years as a member of the Executive Committee of the ACS Division of Organic Chemistry. Areas of research interest in the Hart group include synthetic and mechanistic organic chemistry. Students are involved with the development of new and old reactions for use in organic synthesis. Once developed, these reactions are applied to the synthesis of structurally and biologically interesting natural products. Areas of currently under investigation are free radical reactions,N-acyliminium ion chemistry, oxonium-ion mediated cyclization reactions, and lipid chemistry. Examples of natural products currently serving as targets for synthesis in the Hart group include alkaloids (cylindrospermopsin), terpenoids (polyandranes), and macrolides (lasonolide A). Misquitta, Yohann; Cherezov, Vadim; Havas, Fabien; Patterson, Suzanne; Mohan, Jakkam M.; Wells, Angela J.; Hart, David J.; Caffrey, Martin. Rational design of lipid for membrane protein crystallization. Journal of Structural Biology (2004), 148(2), 169-175. Coleman, Bridgett E.; Cwynar, Valerie; Hart, David J.; Havas, Fabien; Mohan, Jakkam Madan; Patterson, Suzanne; Ridenour, Sam; Schmidt, Michael; Smith, Eboney; Wells, Angela J. Modular approach to the synthesis of unsaturated 1-monoacyl glycerols. Synlett (2004), (8), 1339-1342. Donahue, Matthew G.; Hart, David J.. C19 quassinoid model studies: preparation of trans-perhydroindans via a vinylogous Mukaiyama aldol - free-radical cyclization route. Canadian Journal of Chemistry (2004), 82(2), 314-317. Hart, David J.; Patterson, Suzanne; Unch, James P. Lasonolide A: Synthesis of A and B rings via a cycloetherification strategy. Synlett (2003), (9), 1334-1338.